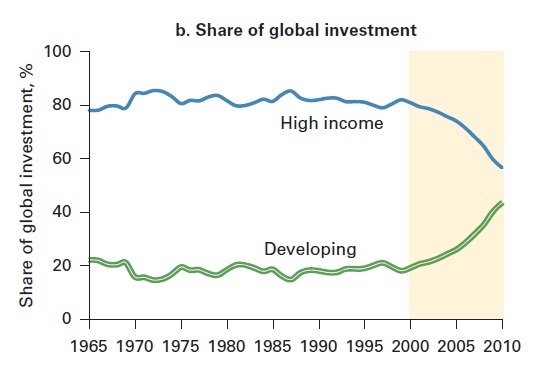 Here are the three ages of financial globalization, according to the Global Development Horizons report from the World Bank on the theme "Capital for the Future: Saving and Investment in an Interdependent World" (as usual, citations and footnotes are omitted for readability). "Progress toward full capital market liberalization among developed countries took a large step forward in the post–Bretton Woods period, which may be regarded as the Second Age of Financial Globalization. Obligations under the Organisation for Economic Co-operation and Development’s Code of Liberalization were broadened to include virtually all capital movements, including short-term transactions by enterprises and individuals. Rapid globalization in the financial industry in the 1990s and 2000s brought even more dramatic change to the landscape of the global financial system, not only encouraging steep increases in cross-border capital fl ows as money market instruments, forwards, swaps, and other derivatives were created, but also allowing developing countries to be integrated into the global financial system in earnest. At present, the world appears to be in a transition into a Third Age of Financial Globalization. The beginnings of this shift would likely have occurred in the early 2000s as developing countries became more integrated into the global fi nancial system and capital inflows to them became significant in absolute terms for the first time. 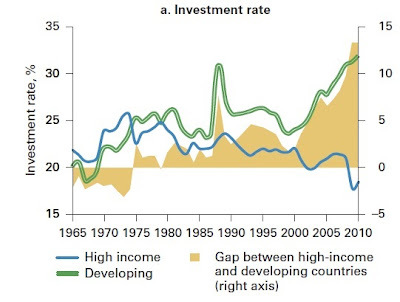 The trend became more noticeable during the global financial crisis, when gross inflows of capital to developing countries declined much less than inflows to advanced countries ... [D]eveloping countries will likely account for a steadily increasing share of inflows in the future—a continuation of the trend that began in the precrisis years." Here are some graphs to illustrate this Third Age of Financial Globalization. Let's start by looking at investment. 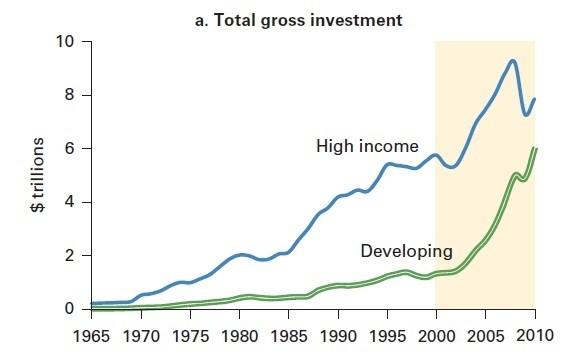 The first graph shows total gross investment: the amount done in developing countries has almost already caught up with that done in high-income countries. 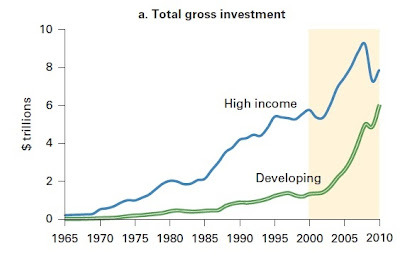 The second graph shows the same information as a share of global investment: developing countries hovered at about 20% of total global investment from the 1960s up through about 2000, but now are close to half of total investment. The third graph shows the annual investment rate. 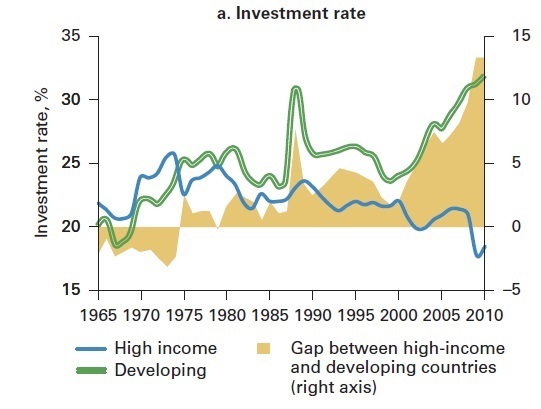 While the investment rate in developing countries has been higher since about 1980, the lines for developing and high-income economies really start diverging around 2000. Now switch over to the savings side. 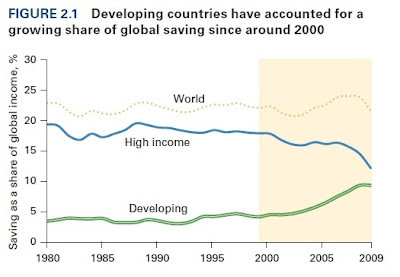 The top graph shows that world saving as a share of global income hasn't changed much since 1980, but the share of that saving coming from developing countries has risen dramatically. Sure, a substantial share of this change is the savings and investment patterns in China, but it shouldn't be dismissed on those grounds. First, saying that anything is "just about China" is a peculiar way of talking about what is headed toward being the world's largest economy. Second, the trend toward more saving and investment is also happening across the rest of the developing countries, although the trend isn't as pronounced. 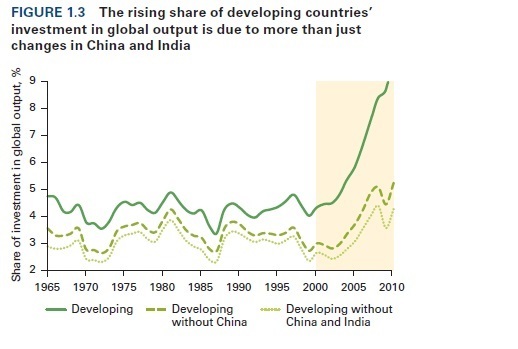 The first graph shows the share of investment relative to total global output for developing countries, and then for developing countries without China and India. 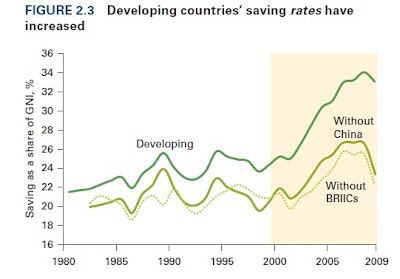 The second graph shows savings rates for developing countries as a whole, and then without China and without the other BRIICs (that is, Brazil, Russia, India, Indonesia, and China). A few decades ago, it was common to be taught that low-income countries were trapped by their low rates of saving and investment, and their inability to attract foreign capital. Maybe the trap was real a few decades ago, but it's a trap that is being shattered in this Third Age of Financial Globalization. The Global Wage Report 2012/13 from the International Labour Organization has this useful figure comparing minimum wages across high-income countries. The horizontal axis shows the minimum wage as a percentage of the median wage for the country. By this measure, the U.S. minimum wage ranks among the lowest in the world at less than 40% of the median wage, although comparable to Japan and Spain. 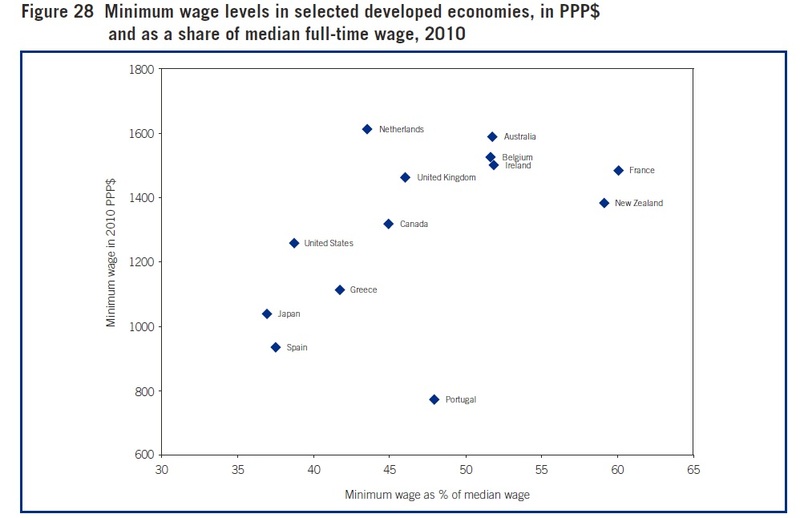 France and New Zealand have a minimum wage that is about 60% of the median wage. The vertical axis shows the minimum wage converted to dollars (using the purchasing power parity exchange rate). 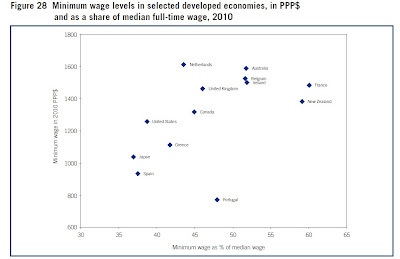 By this measure, the U.S. minimum wage is middle-of-the-pack, above Japan and similar to Canada, although well below the United Kingdom, France, Australia, and Netherlands. For a post on how the minimum wage affects employment and prices, see my February 2013 post on "Minimum Wage and the Law of Many Margins." For a post on proposals to raise the minimum wage, see my November 2012 post on "Minimum Wage to $9.50? $9.80? $10?" 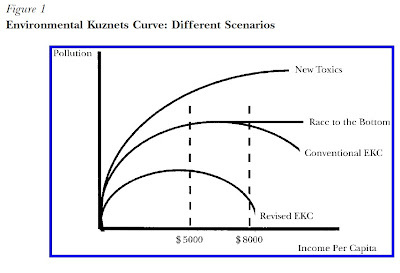 Of course, the environmental Kuznets curve is a theory that needs to be supported or refuted with evidence, not a law of nature like the boiling point of water, and it's a theory that is under ongoing discussion and debate. And the experience of China, with its burgeoning economy and extraordinary environmental issues, is at the center of the debate. Dasgupta, Laplante, Wang, and Wheeler offer a summary of some possible outcomes in this diagram. 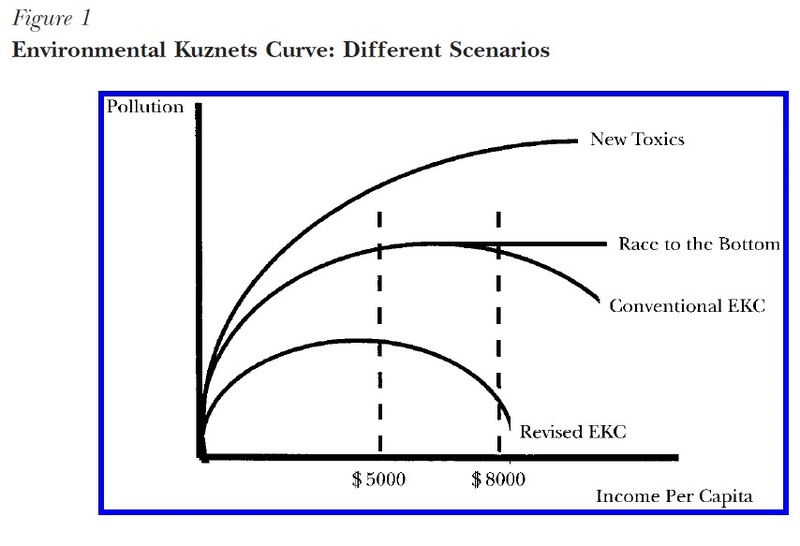 The conventional environmental Kuznets is that emissions of pollutants rise up until some level between about $5000 and $8000 in per capita income, and then fall after that point. There is some historical evidence to support this claim. However, skeptics suggest that even if some pollutants are reduced, new toxic materials are often created that continue to increase. Or perhaps a "race to the bottom" will occur, in which pollution levels first rise, but then society becomes unwilling to act to reduce pollution, for fear that economic activity will decline or depart, and so pollution doesn't fall. 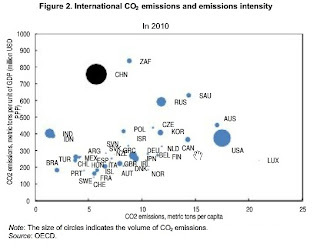 On the other side, optimists point out that countries which are currently industrializing can draw on the anti-pollution technology and legislative experience of other countries, and thus may be able to find ways to increase pollution by less than historical experience, and have the peak of the environmental Kuznets curve at a lower level of per capita income. According to the World Bank, China's per capita GDP was $5,445 in 2011, so it is just reaching the levels where its pollution should first start to level off, and then to decline. Sam Hill has published a report called "Reforms for a Cleaner, Healthier Environment in China" as a working paper for the OECD economics department. It can be read for free on-line via a clunky browser here. 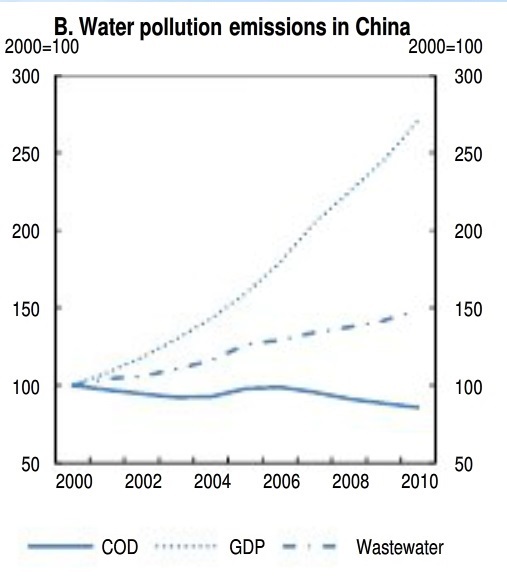 China's environmental problems have enormous costs. Hill writes (citations omitted): "Combined health costs from PM [particulate matter] and water pollution reached nearly 4% of GNI by the late 2000s. The cost of CO2 emissions ... together with material damage from air pollution and soil nutrient depletion, adds some 2.5% of GNI. Incorporating additional costs associated with energy and mineral depletion brings the total costs of environmental degradation to around 9% of GNI." With costs this high, even cold-blooded analysis by those who do not hug trees in their spare time will justify a greater degree of environmental protection. Interestingly, there are signs that for some pollutants, the level of pollution is no longer rising with the growth of China's economy. 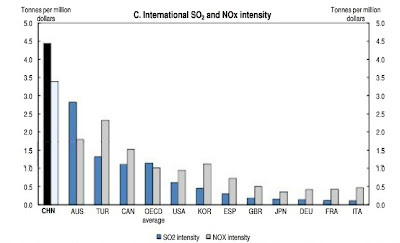 For example, here's a figure about air pollution. The top line shows the growth of GDP. Emissions of sulfur dioxides and soot have not been rising with GDP, and even emissions of carbon dioxide have been lagging behind the rise in GDP in the last few years. Here's a similar figure for water pollution. Chemical oxygen demand (COD) measures the level of organic pollutants in water. Both that measure and wastewater are at least not rising at the same pace as GDP. 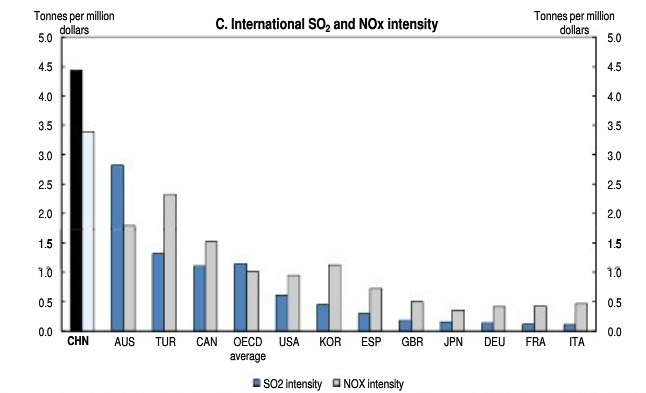 It remains true that China's amount of pollution relative to its economic output is high by the standards of high income countries. Here's a graph showing measured for sulfur dioxide and nitrogen oxides. 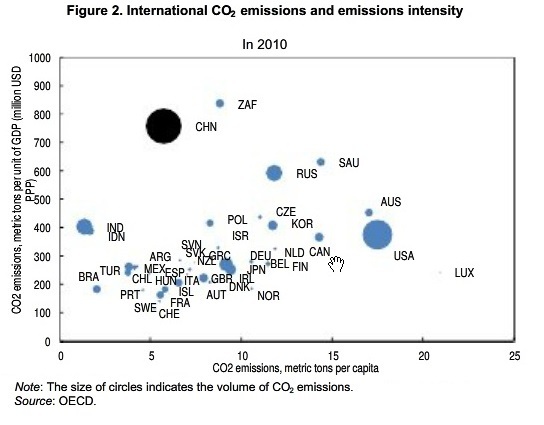 The following graphs show a measure for carbon dioxide. 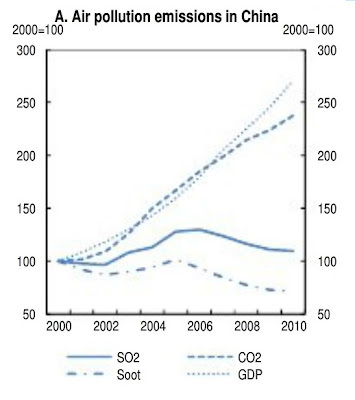 China's pollutants relative to its level of GDP remain high in part because its economy is just starting a transition from manufacturing to services, and in part because environmental rule and regulations in China are looser and more lightly enforced. The policy prescription for reducing pollution in China is clear enough: close down older facilities, and make sure their replacements have up-to-date anti-pollution equipment; keep building sewage treatment facilities; put a price on polluting activities to encourage conservation; and so on. Sam Hill's paper has details. 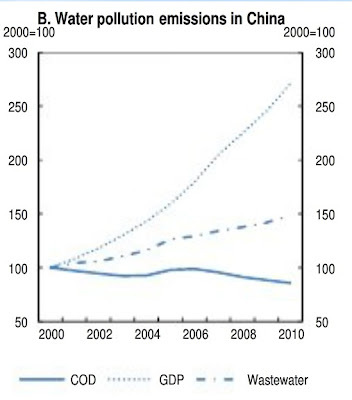 But ultimately, China's path along the environmental Kuznets curve will be determined by politics and public pressure, and public pressure in China does seem to be building for stronger environmental protection. The (wonderfully named) Elizabeth C. Economy at the Council of Foreign Relations recently wrote a brief piece on "China’s Environmental Politics: A Game of Crisis Management," which notes the growing number of environmental public protests in China. In a society under such a high degree of government control, environmental protests can become a place where those discontented with government have a semi-safe space for dissent. in the 5 percent to 8 percent range. I think when our saving rate gets below that range for a sustained period of time, that’s something that one ought to worry about." Why don't fast-growing countries borrow instead of save? "The theory in every textbook says that if you know you’re going to be richer in the future because you’re a fast-growing country, why in the world would you save now, when you’re poor, making your future rich self better off? It makes much more sense to borrow now since it’ll be easy for you to pay off that debt in the future when you’re richer. The latest example that’s on everybody’s minds is, of course, China, a country that has grown very fast for the last 20 years and has had a saving rate that just seems to get higher every year. ... But what China is doing right now actually looks virtually identical to Japan 30 years ago. Japan didn’t have a particularly high saving rate in the 1950s, and by the 1970s it had the highest saving rate in the world, and that was a period of high growth in Japan. It’s also true in South Korea. It grew at a very rapid rate starting from the early 1960s, and its saving rate went up and up. We also see this in Taiwan, Singapore, and Hong Kong. And it’s not just East Asian countries; the same is true of Botswana and Mauritius. It’s also true in the opposite direction for European countries, which were growing pretty fast after World War II. ... So it seems to be a pretty pervasive, large effect that is really very much the opposite of what you’d expect from the standard off-the-shelf models. ... In fact, what I really think is the right story is one that combines habit formation and a precautionary motive, such that they intensify each other. If I have these habits, then a good reason to resist spending when my income goes up is uncertainty over whether the factory that I’m working for will close down and I’ll have to go back to my rural peasant roots." "The explanation I proposed at the conference was to say that, within some range, people trust that their employer has figured this out for them. The job of the human resources department is to figure out what my default contribution ought to be, and it would be too hard to solve this problem myself, so I’m just going to trust that somebody else has done it. It’s not different from when you take an airplane and you trust that the FAA has made sure that it’s safe, or when you go to the doctor and you trust that the advice makes sense and is not going to poison you. Maybe people trust that the default option is going to be a reasonable choice for them. ... If people are going to trust the employer to make a good decision, we ought to make some effort to give the employer the incentives to actually make that good decision." Carroll was a senior economist at the Council of Economic Advisers in 2008-09. Why doesn't the president offer the best possible economic arguments in his speeches? "The CEA tends to vet speeches that the president and sometimes other officials are going to make, and to help set the priorities for what’s going to be in the speeches. A number of times we would help to reshape the speech to make sure that key points were highlighted, and the arguments that we thought were the soundest economic arguments were made. And then the president would go out and give the speech, and I would later hear from economist friends, who would write to me complaining, “Why didn’t the president say this obvious point in the speech that he just made?” And that obvious point was the thing that the CEA had deliberately made sure was actually a highlight of the speech! But, of course, what your friend actually sees is the 15 seconds that gets excerpted on the news or some blogger’s two-paragraph reaction to the president’s speech. ... The president has a greater ability to express his point of view and get it heard than any other single person. But I think the extent to which even the president can’t penetrate through the fog of information and the vast number of sources of data that people pay attention to is underappreciated." Mark Dixon of the U.S. Census Bureau has authored Public Education Finances: 2011. 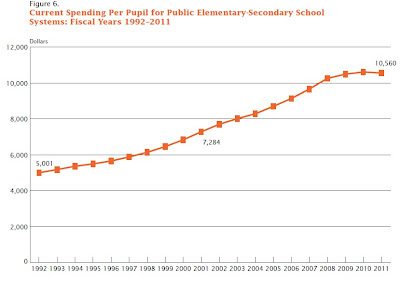 The headline finding is that in 2011, per capita spending on K-12 education declined. The drop was a small one, only about 0.4%, but it's also the first and only drop in the last 40 years. It's yet another symptom of how brutal the Great Recession and its aftermath have been for state and local finances. For the U.S. as a whole, average public school K-12 current spending per student was $10,560 in 2011, with 61% of that going to "instruction," and 35% going to "support services." But four jurisdictions--New York, Wyoming, Alaska, and the District of Columbia--spend more than $16,000 per K-12 student, with New York leading the way at $19,076 per student. Conversely, Idaho, Utah, Arizona, Oklahoma,and Mississippi spend less than $8,000 per student, with Utah having the lowest tally at $6,212 per student. 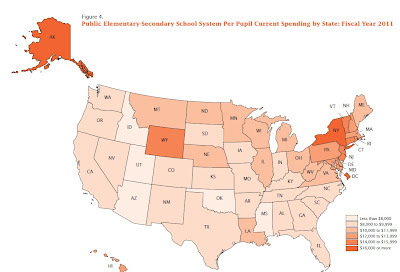 That is, New York spends on average three times as much per K-12 student as does Utah. It would of course be a vulgar error to assume that high spending is what's important in K-12 education, when what actually matters is how the students achieve. Spending on education will reflect factors like the local cost of living, the extent of poverty and special needs in the state, and the legacy of past negotiations with the teachers' unions. Still, the discrepancies in what states spend is striking. In January, I blogged in "Head Start is Failing Its Test" about a high-quality study being done by the U.S. Department of Health and Human Services, which found: "In summary, there were initial positive impacts from having access to Head Start, but by the end of 3rd grade there were very few impacts found for either cohort in any of the four domains of cognitive, social-emotional, health and parenting practices. The few impacts that were found did not show a clear pattern of favorable or unfavorable impacts for children." One of the main difficulties in evaluating preschool programs is that just comparing children in such programs and not in such programs won't be a fair approach. After all, families differ in many ways, some of them not easily measureable, and these differences need to be taken into account. Thus, a preferred method is an "experimental" approach, in which out of a group of families, some are randomly assigned to the preschool program and some are not. Of course, one can then look at observable characteristics to see if the assignment was really random: that is, families with children randomly chosen to be enrolled in the preschool program should have the same average income, education level, employment level, proportion of single parents, and so on, compared with the families whose children were not randomly enrolled in the program. But random enrollment also offers a plausible way of adjusting for unobservable differences in families, like the level of emphasis that the family puts on school or persistence or work. Duncan and Magnuson focus on the studies of preschool done with these kinds of random assignment experimental methods, and identify 84 such studies over the last half-century (including the Head Start study mentioned earlier. They summarize the results of these 84 studies in this figure. 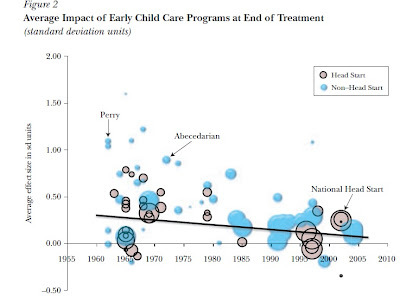 1) There is evidence of short-term gains from preschool programs. 2) The average level of gains from such programs seems to be falling over time (as shown by the downward-sloping line). This finding is distressing, because one would hope that such programs could become more effective over time. 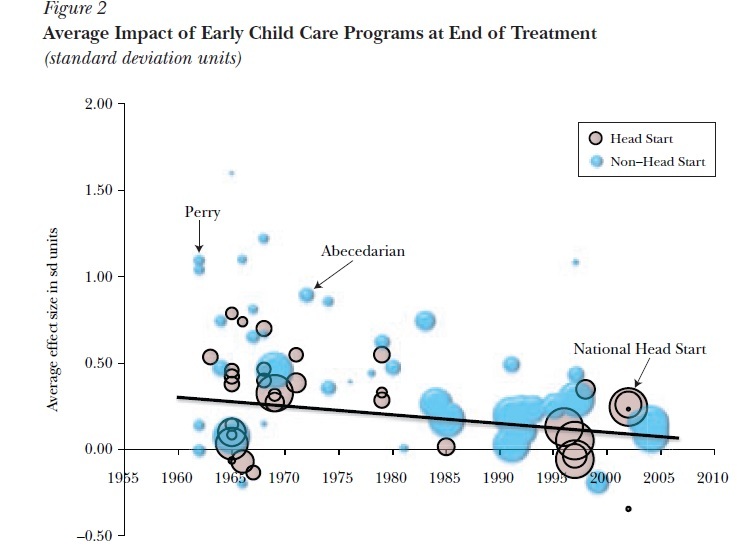 But a likely reason is that parents (especially the mothers) of children in these preschool program are not as deeply disadvantaged in recent years as they were back in the 1960s, when levels of literacy, health, and income were much lower. Because the parents better educated and have higher income, the gains from preschool are smaller. 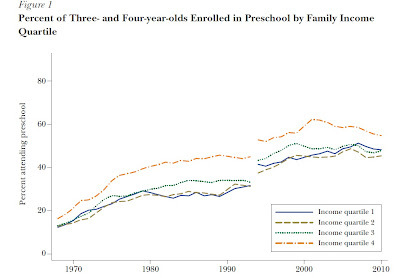 3) Academic gains from preschool programs tend to fade out. As they write: "Most early childhood education studies that have tracked children beyond the end of the program treatment find that effects on test scores fade over time." 4) However, some very long-term studies have found that although measures of cognitive and achievement gains fade, there are often still observable behavioral effects like improved high school graduation rates, lower rates of teen parenthood, and lower rates of criminal behavior. This finding creates a puzzle, because even with batteries of questionnaires and tests for the children, their teachers, their parents, and others, researchers have not yet been able to measure what it is in preschool programs that might produce these positive long-term results. So where does all of this mean for proposals for universal preschool, like the "Preschool for All" initiative announced by President Obama along with his 2014 proposed budget? I know that for some people, the word "universal" is a sort of talisman that carries echoes of equality and justice. 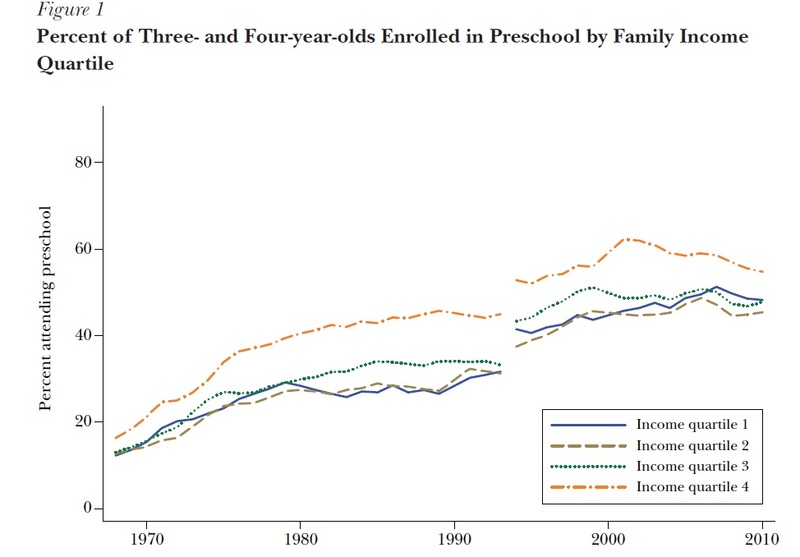 But it's perhaps worth noting as a starting point that although preschool attendance has been increasing over time, it is far from universal now for any income group. Duncan and Magnuson provide this figure showing the share of 3 and 4 year-olds enrolled in preschool, divided up by income level. Preschool attendance has risen over the decades but it now represents about half of all children. In discussions of "universal" preschool, it's never quite clear to me whether universality is intended to apply to all income levels, or whether only the children of low-income families are to "universally" attend pre-school. The word "universal" is no guarantee of quality. After all, we have "universal" K-12 schooling, but that certainly doesn't mean that all children across the United States are in high-quality or even roughly equivalent schools. "Universal" is certain to be costly. There is a strong case for further experiments with an array of early childhood interventions, including preschool, to have a better sense of what works, and why. Right now, the sad truth is that there is so much we don't know. "Nearly three-quarters of U.S. households own pets. There are about 218 million pets in the United States, not counting several million fish. ... Americans spent approximately $61.4 billion in total on their pets in 2011. On average, each U.S. household spent just over $500 on pets. This amounts to about 1 percent of total spending per year for the average household. ... Expenditures on pets include pet food, pet purchases, supplies and medicine, pet services, and veterinarian services." Two comparisons leaped to mind when I saw these figures. First, all through last year there were stories about high spending of the 2012 U.S. election campaign. The Federal Election Commissions reports that about $7 billion was spent. But to put the number in the context of dogs and cats, America spent about nine times as much on pet care as it did on choosing all its federally elections in 2012. Second, the World Bank often uses a poverty line of $1.25/day in consumption to measure deep destitution in developing countries. Nearly one-third of the population of South Asia and nearly half the population of Africa has a consumption level below this line. Over 365 days in a year, $1.25/day works out to $456.25. Thus, the average U.S. household spends more on pets than the poverty line for humans in the developing world. And the statistics don't include the fact that pets live rent-free. "In 2011, households spent more on their pets annually than they spent on alcohol ($456), residential landline phone bills ($381), or men and boys clothing ($404). "Average household spending on pet food alone was $183 in 2011. This was more than the amount spent on candy ($87), bread ($107), chicken ($124), cereal ($175), or reading materials ($115). 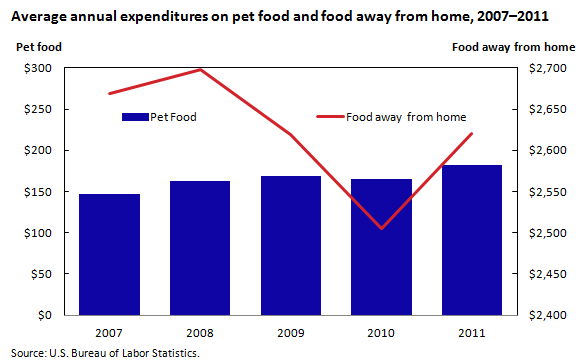 "Even when spending at restaurants dropped during the recent recession (December 2007–June 2009), spending on pet food stayed constant. (See chart 1.)" I am deeply aware of all the grim news for the U.S. economy during the last five years. But when the average household is spending $500/year on pets, it's a reminder that America's average standard of living remains quite high. Overall, the report emphasizes that the global shift to urbanization works together with many development goals. 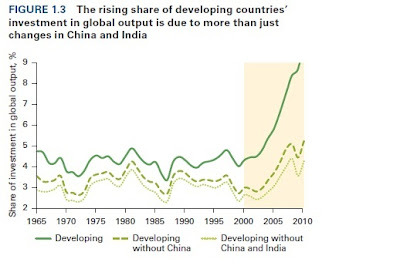 "Location remains important at all stages of development, but it matters less in rich countries than in poor ones. Estimates from more than 100 Living Standard Surveys indicate that households in the most prosperous areas of developing countries such as Brazil, Bulgaria, Ghana, Indonesia, Morocco, and Sri Lanka have an average consumption almost 75 percent higher than that of similar households in the lagging areas of these countries. In comparison, the disparity is less than 25 percent in developed countries such as Canada, Japan, and the United States." The gains from urbanization are not just in terms of income, but also in terms of other development goals like access to clean water, education, and health care. "In 2010, 96 percent of the urban population but 81 percent of the rural population in developing countries had access to safe drinking water. Disparities in access to basic sanitation were greater: 80 percent of urban residents but only 50 percent of rural residents had access to a toilet. Schooling and health care can also be delivered with economies of scale in dense environments, close to where people actually live." But of course, the wave of urbanization is also generating urban slums, which are different than rural poverty, but pose difficult challenges of their own. "Slums are the urban face of poverty and emerge when cities are unable to meet the demand for basic services and to supply the expected jobs. A likely 1 billion people live in urban slums in developing countries, and their numbers are projected to grow by nearly 500 million between now and 2020. 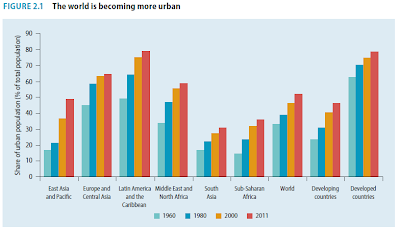 Slums are growing the fastest in Sub-Saharan Africa, southeastern Asia, and western Asia. Currently, 62 percent of Africa’s urban population lives in slums. ...Those in slums lack ownership of property, or even clearly legal rentals; poor services of many kinds; informal employment only, lack of access to credit and services." The issue of slums is in some ways a governance challenge: not just how to provide services in the present to slum-dwellers, but how to establish an appropriate institutional and physical infrastructure. by a tripling in the built-up area of cities, from 200,000 to 600,000 square kilometers." The challenge of thinking about how to address urban slums cannot be overstated. The slums already involve 1 billion people, a total that will grow by over 50% in the next decade. 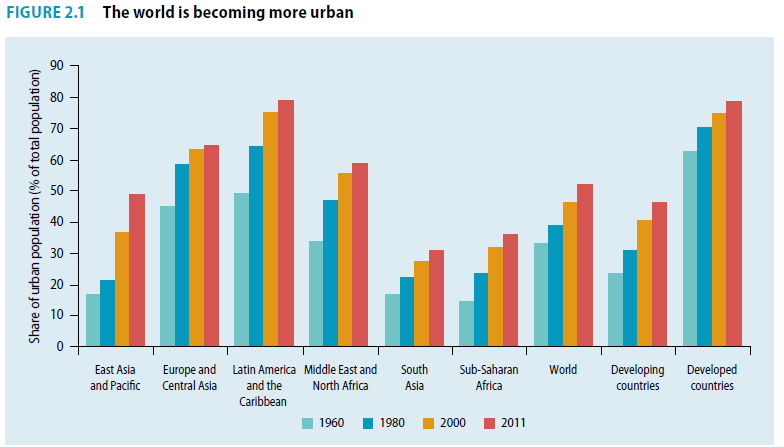 The built-up area of cities in the developing world is likely to triple. And major decisions about physical structure can have a life expectancy of more than a century. There is a delicate balance between needing an overall master plan and needing a lot of a flexibility for evolution and change over time. Even after deciding what to do, financing poses challenges of its own: in particular, how can developing countries establish ways for that poor people can afford what they need, but also pay what they can afford. Then actually getting projects built is often quite difficult, too. Urban areas will differ, of course, in their locations and needs. But there is a great need for rules of thumb, and ideas about best practices, that can offer some guidance for the urban developments that lie ahead. "Finance: Function Matters, Not Size," in a symposium in the Spring 2013 issue of the Journal of Economic Perspectives. (Full disclosure: I've worked as Managing Editor of the JEP since 1987.) Here, I'll list some of the main points that I took away from Cochrane's essay in boldface type, with quotations from the article following. Economists have been arguing for a half-century that active portfolio management isn't worth the fees paid for it (for example, see my post from yesterday). But when high-fee active portfolio management has persisted for decades in the face of such criticism, perhaps it's the critics who should be wondering if they are correct. "High-fee active management and underlying active trading have been deplored by academic finance for a generation. ... It seems the average investor should save 60 basis points a year and just buy a passive index such as Vanguard’s Total Stock Market Portfolio. It seems that the stock pickers should do something more productive, like drive cabs. Active management and its fees seem like a total private, and social, waste. Yet this hallowed view—and its antithesis—do not completely make sense. After all, active management and fees have survived 40 years of efficient-market disdain. Economists who would dismiss “people are stupid” as an “explanation” for a pricing anomaly that lasts 40 years surely cannot use the same “explanation” for the persistence of active management." There are lots of inefficiencies in financial markets that can be exploited, at least for a time, to make profits. "But the last 20 years of finance research is as clear as empirical research in economics can be: There is alpha relative to the market portfolio—there are strategies that deliver average returns larger than the covariation of their returns with the market portfolio justifies—lots of it, and all over the place. ... Examples of such strategies include value (stocks with low market value relative to accounting book value), momentum (stocks that have risen in the previous year), stocks of companies that repurchase shares, stocks of companies with accounting measures of high expected earnings, and stocks with low betas. The “carry trade” in maturities, currencies and, credit—buy high-yield securities, sell low-yield securities—and writing options, especially the “disaster insurance” of out-of-the-money put options, all generate alpha. Expected returns on the market and most of the anomaly strategies vary predictably over time, implying profitable dynamic trading strategies." Highly sophisticated investors pay for active management of their financial assets, and apparently believe they are getting a good deal. "Delegating active management and paying large fees is common and increasing among large, completely unconstrained, and very sophisticated investors. For example, the Harvard endowment was in 2012 about two-thirds externally managed by fee investors and was 30 percent invested in “private equity” and “absolute return,” largely meaning hedge funds. The University of Chicago endowment is similarly invested in private equity and “absolute return.” Apparently, whatever qualms some of its curmudgeonly faculty express about alphas, fees, and active management are not shared by the endowment. ... Why have these decision procedures become standard practice? Vague reference to “agency problems” and “naiveté” seem unpersuasive. Harvard’s endowment was overseen by a high-powered board, including its president Larry Summers, possibly the least naive investor on the planet. The picture that Summers and his board, or the high-powered talent on Chicago’s Investment Committee are simply too naive to demand passive investing, or that they really want the endowments to be invested in the Vanguard total market index, but some “agency problem” with the managers they hire and fire with alacrity prevents that outcome from happening, simply does not wash."
The existence of financial bubbles suggests that markets are inefficient, too. But many of those who are most insistent that financial markets are inefficient often shy away from the logical implication that if the market is inefficient, it might benefit from additional trading. "The common complaints “the financial crisis proves markets aren’t efficient,” or that tech and mortgages represented “bubbles,” are at heart complaints that there was not enough active information-based trading. All a more “efficient” market could have done is to crash sooner, by better expressing the pessimist’s views. ... If information is not incorporated into market prices and to such an extent that simple strategies with big alphas can be published in the Journal of Finance, there are not enough arbitrageurs. If asset prices fall in “fire sales,” only to rebound later, there are not enough buyers following the fire trucks. If credit constraints are impeding the flow of capital, there is a social benefit to loosening those constraints." "The increase in fees for residential loan origination is easily digested as the response to an increase in demand. The increase in housing demand may indeed not have been “socially optimal” (!). There are plenty of government policies and perhaps a few market dislocations to blame. But it doesn’t make much sense to criticize growth in the financial industry for responding to this increase in demand, whatever its source, or for passing along the subsidized credit—which was and remains the government’s explicit intention to increase—with the customary fee. ... There was a lot of financial innovation in mortgage-backed securities, some of which notoriously exploded. But here again, whether we spend a bit of GDP filling out forms or paying fees is clearly the least of the social benefit and cost questions. The “shadow banking” system was prone to a textbook systemic run, which happened. This fragility, not the size or fraction of GDP, is the important issue." We don't really understand the process of price discovery in financial markets, and as a result, passive investing may be less intuitively attractive on a second glance. "The fact staring us in the face is that “price discovery,” the process by which information becomes embedded in market prices, uses a lot of trading volume, and a lot of time, effort, and resources. And we are only beginning to understand it.... [P]erhaps we should work just a little harder before dismissing the hundreds of years of trading activity, and the entire existence of the New York Stock Exchange, Chicago Mercantile Exchange, and other markets, as monuments to human folly, or before advocating regulations such as transactions taxes —the perennial favorite answer in search of a question—to reduce trading volume whose size, function, and operation we do not understand. Are we sure that they should not be transactions subsidies? And before we deplore, it’s worth remembering just how crazy passive indexing sounds to any market participant. “What,” they might respond, “would you walk in to a wine store and say ‘I can’t tell good from bad, and the arbitrageurs are out in force. I sure won’t pay you 1 percent for recommendations. Just give me one of everything’?”"
The important aspects of the financial sector that we don't understand are a good basis for research, but in the real world of political economy, they could well be a bad basis for additional regulation. economic forces that allowed high-fee active management to survive so long. Cochrane's paper is part of a five-paper symposium on "The Growth of the Financial Sector" in the Spring 2013 issue of the Journal of Economic Perspectives. Economies of Scale in Asset Management: Who Benefits? The total assets managed by domestic equity funds rose from $26 billion in 1980 to $3.5 trillion in 2010. Would you expect the expenses charged by such funds to rise in proportion to the amount that they manage? Or by less? "There should be substantial economies of scale in asset management. It is no more costly to place an order for 20,000 shares of a particular stock than it is to order 10,000 shares. Brokerage commissions (which are usually set in a flat dollar amount per transaction, at least within broad ranges of transaction size) are likely to be similar for each purchase ticket, as are the “custodial fees” paid to the bank that holds the securities that are owned. The same annual report and similar filings to the Securities and Exchange Commission are required whether the investment fund has $100 million in assets or $500 million. The due diligence required for the investment manager is no different for a large mutual fund than it is for a small one. Modern technology has fully automated such tasks as dividend collection, tax reporting, and client statements." Malkiel also cites more rigorous academic studies that find economies of scale. But despite the more than 100-fold increase in share of assets under management for these funds, the average amount paid as expenses has not declined in three decades. Here's the table, showing an expense ratio of 66 basis points of assets under management in 1980, but 69.2 basis points as a share of assets under management in 2010.
the asset managers. The same finding appears to hold for asset managers who cater to institutional investors." The table shows some other interesting factors. Equity funds can either be "actively managed," by those trying to anticipate where the market is headed, or "passively managed," by index funds that seek only to replicate what happens in the market. In 1980, 99.7% of all stock market funds were actively managed; by 2010, 71% were actively managed. 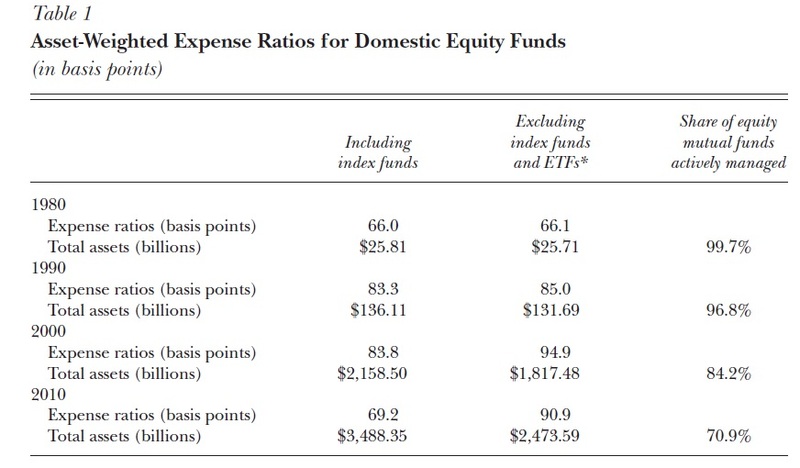 The expense ratios for passively managed funds are often very low, at 7 basis points or less. The expense ratios for actively managed funds alone (shown in the second column of the table) have actually risen from 66 basis points back in 1980 to over 90 basis points as a share of assets in the last decade or so. And remember, this is during a period when economies of scale should have been a force for driving down expenses as a share of assets! "Clearly, one needs some active management to ensure that information is properly reflected in securities prices. Those professionals who act to exploit any differential—however small—between price and estimated value deserve to be compensated for their efforts. But it appears that the number of active managers and the costs they impose far exceed what is required to make our stock markets reasonably efficient, in the sense that no clear arbitrage opportunities remain unexploited. Worldwide, vast numbers of highly trained independent experts are expressing estimates of value each day. Outperforming the consensus of hundreds of thousands of professionals at the world’s major financial institutions is next to impossible, as it has been for decades. ... The major inefficiency in financial markets today involves the market for investment advice, and poses the question of why investors continue to pay fees for asset management services that are so high." I'm sure there are people and institutions that can benefit from sophisticated investment advice that seek to hedge the specific risks they face while leaping to exploit the occasional profit opportunities provided by temporary anomalies in financial markets. But most average investors in actively managed funds are not following this pattern. They are following either their own gut reactions, or the gut reactions of an active portfolio manager, about what is likely to rise and fall. In doing so, they are paying much higher fees over what an index fund would have cost. Malkiel cites one study that found if the average mutual fund investor in actively managed funds had just bought and held a passive index fund from 2000 to 2011, rather than trying to chase every trend, that average investor would have increased return on investment by almost 2 percentage points per year--a gain of more than 20% over the decade. It's widely known that the U.S. financial sector has grown substantially in recent years. But by how much? And in what specific areas? Robin Greenwood and David Scharfstein offer a useful breakdown in "The Growth of Finance," which appears in the most recent (Spring 2013) issue of my own Journal of Economic Perspectives. Like all JEP papers from the most recent back to the first issue in 1987, it is freely available on-line compliments of the American Economic Association. Greenwood and Scharfstein write at the start: "During the last 30 years, the financial services sector has grown enormously. This growth is apparent whether one measures the financial sector by its share of GDP, by the quantity of financial assets, by employment, or by average wages. 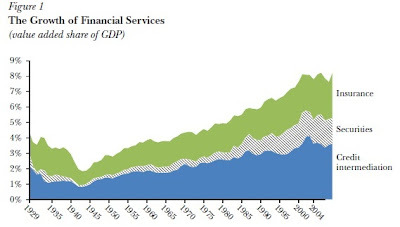 At its peak in 2006, the financial services sector contributed 8.3 percent to US GDP, compared to 4.9 percent in 1980 and 2.8 percent in 1950." But what is actually meant by "the finance sector"? Here's a useful figure dividing the sector into three parts: securities, credit intermediation, and insurance. "The securities subsector ... includes the activities typically associated with investment banks (such as Goldman Sachs) and asset management firms (such as Fidelity). These activities include securities trading and market making, securities underwriting, and asset management for individual and institutional investors. The credit intermediation industry performs the activities typically associated with traditional banking—lending to consumers and corporations, deposit taking, and processing financial transactions." "Our main finding is that much of the growth of finance is associated with two activities: asset management and the provision of household credit. The value of financial assets under professional management grew dramatically, with the total fees charged to manage these assets growing at approximately the same pace. A large part of this growth came from the increase in the value of financial assets, which was itself driven largely by an increase in stock market valuations (such as the price/earnings multiples). There was also enormous growth in household credit, from 48 percent of GDP in 1980 to 99 percent in 2007. Most of this growth was in residential mortgages. Consumer debt (auto, credit card, and student loans) also grew, and a significant fraction of mortgage debt took the form of home equity lines used to fund consumption. The increase in household credit contributed to the growth of the financial sector mainly through fees on loan origination, underwriting of asset-backed securities, trading and management of fixed income products, and derivatives trading." "Thus, any assessment of whether and in what ways society benefited from the growth of the financial sector depends in large part on an evaluation of professional asset management and the increase in household credit. In our view, the professionalization of asset management brought signififi cant benefits. The main benefit was that it facilitated an increase in financial market participation and diversification, which likely lowered the cost of capital to corporations. Young firms benefited in particular, both because they are more reliant on external financing and because their value depends more on the cost of capital. At the same time, the cost of professional asset management has been persistently high. While the high price encourages more active asset management, it may not result in the kind of active asset management that leads to more informative securities prices or better monitoring of management. It also generates economic rents that could draw more resources to the industry than is socially desirable." "While greater access to credit has arguably improved the ability of households to smooth consumption, it has also made it easier for many households to overinvest in housing and consume in excess of sustainable levels. This increase in credit was facilitated by the growth of “shadow banking,” whereby many different types of nonbank financial entities performed some of the essential functions of traditional banking, but in a less-stable way. The financial crisis that erupted late in 2007 and proved so costly to the economy was largely a crisis in shadow banking." The Spring issue of the JEP actually includes four other papers with varying perspectives on the growth of the financial sector. In the next couple of days, I'll post about some of these very divergent views. But as a prelude, I'll point out that most of the time, when economic activity grows in a certain area, those of us who believe in economic prosperity tend to view that growth as a good thing. If the U.S. car industry or computer industry racked up large sales, that would be viewed in a positive light. Clearly, many people feel differently about the financial sector. But is that negative reaction just a manifestation of the long-standing generalized prejudice against finance? After all, I'm delighted that I can put my retirement savings into a no-load mutual fund, and that I don't have to try to construct and manage such a fund on my own. I'm delighted when it's easy for me to get a mortgage. It seems undeniable to me that excesses in the financial sector played a large role in the run-up to the Great Recession. But maybe the problem isn't the size of the financial sector, but rather its instability. After all, many of the proposals for a higher level of regulation will impose higher costs that in turn will tend to make the financial sector larger, not smaller. The offices of high school guidance counselors and directors of college admissions are full of statistics about how the average person with a college degree earns much more than the average person with a high school degree. But making any decision based on averages is a tricky business. After all, college itself is not a a single experience. There are a wide array of public and private schools, with different costs. 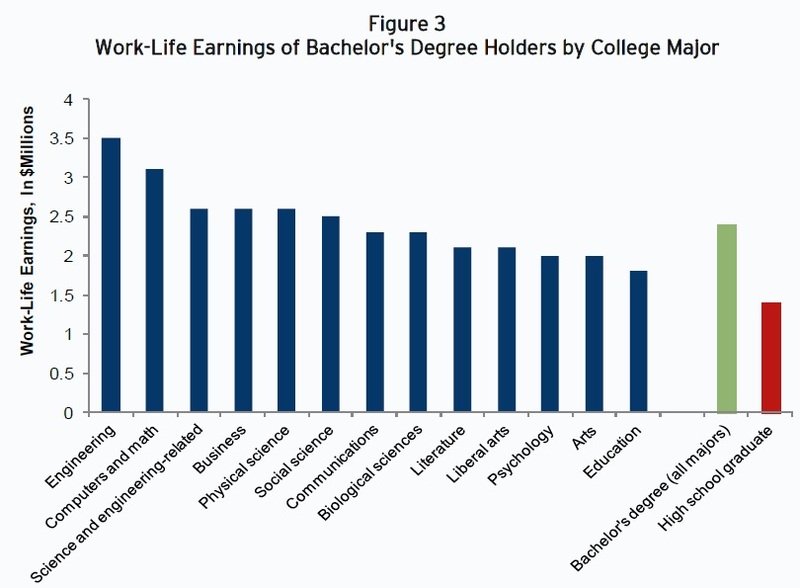 There are a wide array of fields of study, with very different job prospects. Schools vary considerably according to what share of their students graduate. And even further, high school students are very different from each other. If you have been a 30th percentile high school student, it is perfectly reasonable to wonder whether you are going to be an average college student. "There is enormous variation in the so-called return to education depending on factors such as institution attended, field of study, whether a student graduates, and post-graduation occupation. 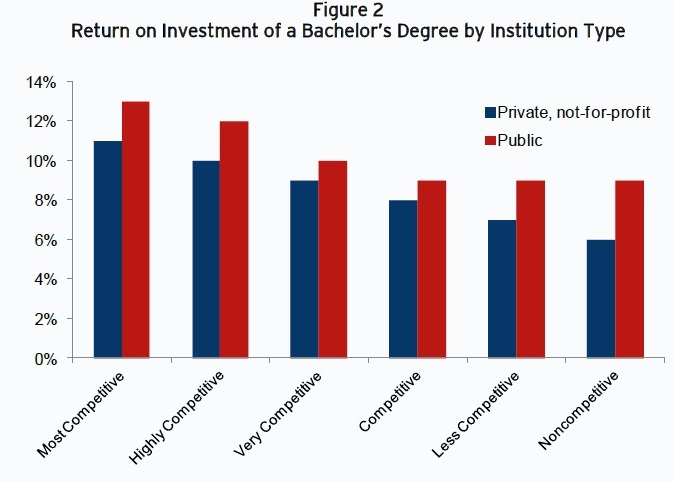 While the average return to obtaining a college degree is clearly positive, we emphasize that it is not universally so. For certain schools, majors, occupations, and individuals, college may not be a smart investment. By telling all young people that they should go to college no matter what, we are actually doing some of them a disservice." Here are a few of their figures that especially jumped out at me. First consider the average return on investment for a bachelor's degree from a range of schools, either more or less competitive in their admissions, and either public or private--where the public schools are less expensive and thus have a higher return. On average--and there's that word "average" again--the return to competitive public schools is more than twice as high as the return to noncompetitive non-for-profit private school. In discussing school by school data, they write: "[N]ot every bachelor’s degree is a smart investment. After attempting to account for in-state vs. out-of-state tuition, financial aid, graduation rates, years taken to graduate, wage inflation, and selection, nearly two hundred schools on the 2012 list have negative ROIs [return on investments]. Students may want to think twice about attending the Savannah College of Art and Design in Georgia or Jackson State University in Mississippi." ewer than 60 percent of students who enter four-year schools finish within six years, and for low-income students it’s even worse. Owen and Sawhill write: "Again, the variation in this measure is huge. Just within Washington, D.C., for example, six-year graduation rates range from a near-universal 93 percent at Georgetown University to a dismal 19 percent at the University of D.C. Of course, these are very different institutions, and we might expect high-achieving students at an elite school like Georgetown to have higher completion rates than at a less competitive school like UDC. 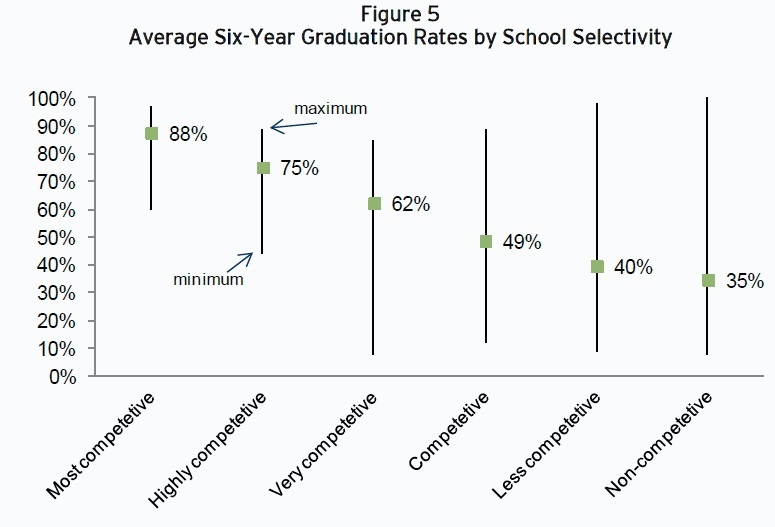 In fact, Frederick Hess and his colleagues at AEI have documented that the relationship between selectivity and completion is positive, echoing other work that suggests that students are more likely to succeed in and graduate from college when they attend more selective schools. At the most selective schools, 88 percent of students graduate within six years; at non-competitive schools, only 35 percent do." Finally, within schools there is a choice of field of study. Those who major in science, engineering, math, or business are likely to do much better than those who focus on arts or education. Indeed, the wage premium for being in a science and technology industry can be more important than the gains from a four-year college degree. Owen and Sawhill write: "Anthony Carnevale and his colleagues at the Georgetown Center on Education and the Workforce use similar methodology to the Census calculations but disaggregate even further, estimating median lifetime earnings for all education levels by occupation. They find that 14 percent of people with a high school diploma make at least as much as those with a bachelor’s degree, and 17 percent of people with a bachelor’s degree make more than those with a professional degree. The authors argue that much of this finding is explained by occupation. In every occupation category, more educated workers earn more.But, for example, someone working in a STEM job with only a high school diploma can expect to make more over a lifetime than someone with a bachelor’s degree working in education, community service and arts, sales and office work, health support, blue collar jobs, or personal services." The recommendations that follow from this kind of essay are straightforward. 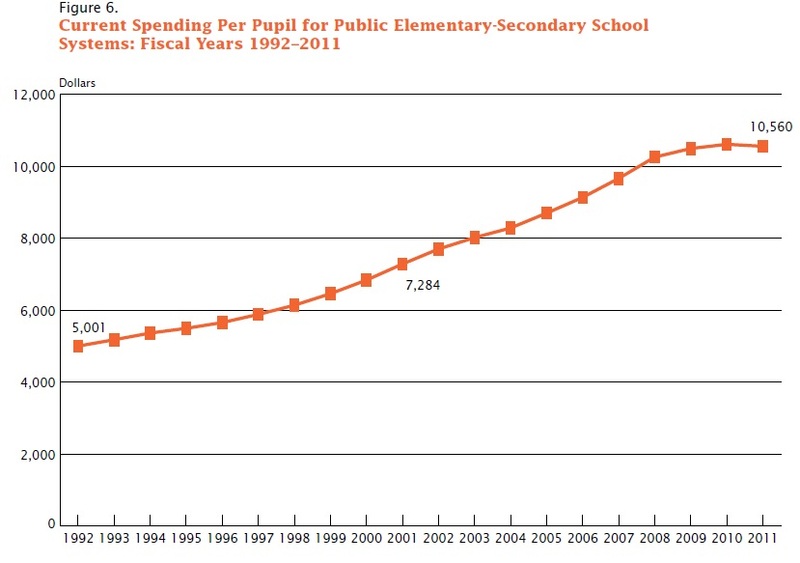 Look at public schools, for their lower cost. 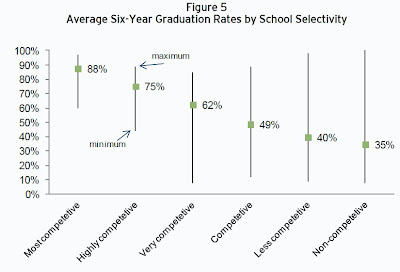 Look at graduation rates, no matter what the selectivity of the institution. Even if math, business, computers and science are not your first love, or your second or third, it is foolish not to spend some of your time in college getting a basic grounding in at least some of these areas. "About 60% of high school students go on to college. For the purposes of a quick-and-dirty estimate, let's say that it's the top 60% by academic qualifications. Thus, if you are at, say, the 70th percentile of your high school class, you are in the middle of those going on to college. Given that many of those who go on to college don't finish a degree, being at the 70th percentile of your high school class may mean that you can expect to be ranked in the bottom quarter of those who complete a college degree. Sure, some students will improve dramatically from high school to college, but it's a statistical fact that half of college graduates will be below the median, and one-fourth will be in the bottom quarter, and especially if you are advising a large number of high school students, it's unrealistic to tell each of them that that they can all end up in the upper part of the college distribution." In fact, it's unrealistic for high school guidance counselors and college admissions officers to tell everyone that they can all be average. Statistically speaking, they can't.